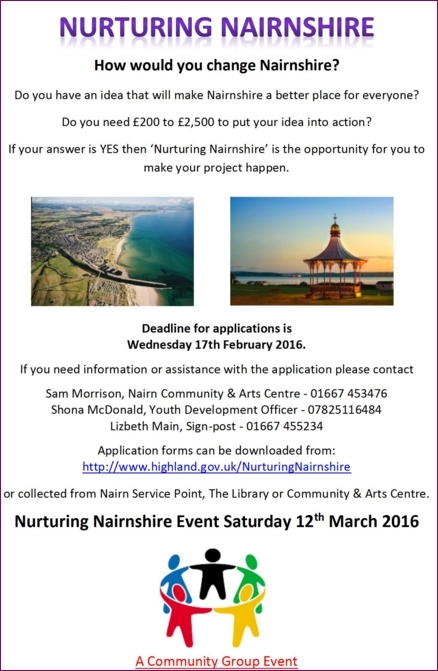 A Gurn from Nurn: "Grants available to help nurture Nairnshire!" Nairn Highland Councillors have set aside £25,000 from the local Ward Discretionary budget to let the local community decide for themselves which projects are needed in their area. Community and voluntary groups in Nairnshire are being encouraged to think of projects that add value to their day-to-day activities. Grants of £200 – £2,500 will be available for groups to put these ideas into action. Any local community, voluntary or non-profit group can apply; projects can be large or small and should aim to make Nairnshire a better place. The funding can be used to fund new projects or go toward bigger projects or ideas. Projects that meet the eligibility criteria will be asked to present their ideas at a ‘Nurturing Nairnshire’ community event on Saturday 12 March, 10am in the Community and Arts Centre, King Street, Nairn, where local people will collectively agree what projects should be supported. Provost of Nairn, Councillor Laurie Fraser speaking on behalf of Nairn Ward Members said: “This is a chance for the local community to make decisions about how funds are allocated at a local level, by empowering the community to make decisions on projects that are most important to the local area. or collected from the Nairn Service Point, Library or Community Centre. Wouldnt it be great if they held a Nairn Gala Week again in Nairn the same time to celebrate the Queens birthday celebration what a great day it would be if they did. I know for sure if they did the whole town would support it including local buisneeses and maybe the local Rotary Club. What are other peoples thoughts on this. Oh yeah, would that be great. We could parade scantly dressed nubile girls as we did in the 1960's and call the winner a 'Gala Queen'. Clearly there are some folk who would greatly enjoy this portrayal of women in 2016. @ Nairn Gala Queen - hopefully Nairn has moved forward in it's attitude towards women. I'm sure some people will support and wish to celebrate the queen's birthday, maybe a few cucumber sandwiches would do the trick?